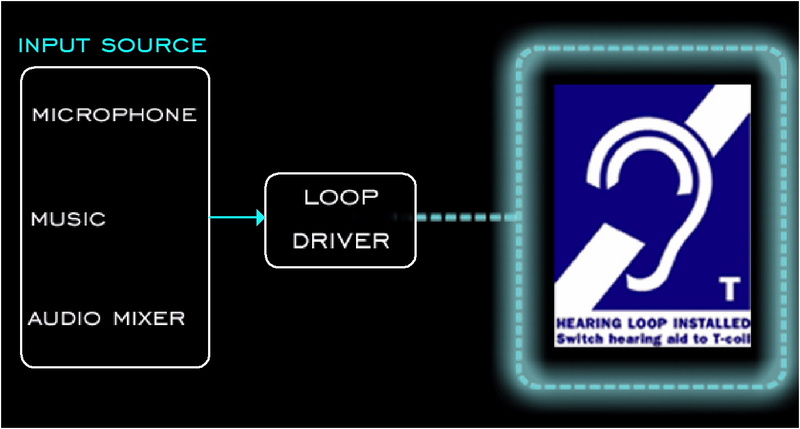 The technical name for a “Hearing Loop” is an Audio Frequency Induction Loop System, or AFILS for short. A Hearing Loop is a form of Assistive Listening technology, one of only three types of wireless systems recommended by the ADA to provide equal access to public places for persons with hearing loss. An audio source such as a microphone serves as an input to a “driver”. A driver is a special type of amplifier which drives the input signal through a loop of wire around a room, thus creating a magnetic field. While in a loop, a special receiver called a T-coil within a cochlear implant or hearing aid converts magnetic impulses into audio. Connect with businesses, public transportation, restaurants, theaters, houses of worship, and more. Hear the audio source directly, with compensation for their hearing loss. Eliminate distance, ambient noise and acoustical space. Experience communication or entertainment with amazing quality and clarity. Avoid the stigma associated with asking for a receiver. Loops can be installed in theaters, auditoriums, museums, airports, trains, taxis, buses, kiosks, service counters, ticket windows, drive-thru windows, outdoor venues...almost anywhere! This list does help to illustrate an important point: Of the three forms of assistive listening technologies mandated by the ADA, loops are the only viable option in transitory environments. No wonder hearing loops are the preferred assistive listening solution among persons with hearing loss...so go out and get looped!